This article shows how to edit reference data (e.g. URL, title, date, etc.) for PDF document with Zotero, so you can import the citation into LibreOffice and create bibliography from it. This article consists of two main parts, editing reference and inserting reference into LibreOffice document. This article assumes you have installed Zotero in Firefox or its Stand Alone version. When you collect PDF file with our previous Zotero instructions, you will find that every PDF entry has no parent item. Parent item is a parent entry where a PDF entry belongs. A PDF file will have reference data (e.g. URL, title, date, etc) only if it has parent item. We will demonstrate how to do it. 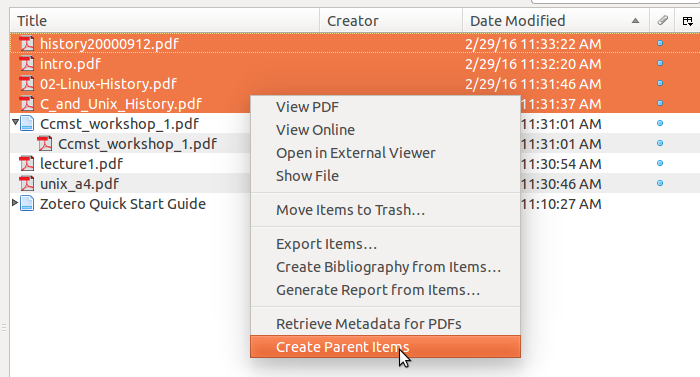 For one single PDF entry in Zotero library, select one entry > right-click > Create Parent Item. This will make a parent item and insert the selected PDF entry inside. Do this if you like to make parent item manually. 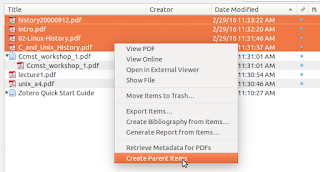 For many PDF entries, select some entries > right-click > Create Parent Items. This will make a parent item for every single PDF entry automatically. Do this if you like to make them automatically. Note: before you do any citing work for PDF, do create parent item first. Make sure every PDF entry has parent item so you can cite them later. What to do with editing reference data for PDF? Basically, editing reference data means editing the parent item. For PDF document, you can modify some aspect such as Title, Author, Abstract, Date, Short Title, URL, Accessed (Date), and some others. while you still can change the category as you wish. To change the title, just click on the Title: field. To change the author, click on the Author: field. You can change the mode, single field or two field (last, first). You can add the author as many as you need by clicking plus (+) button. To change the date, click on the Date: field and type the publish date of the PDF. Don't worry, Zotero will recognize any date format you enter. This data will be used as a part of citation later. To change the URL, click on the URL: field. This picture explains an example for those instructions. Please note that these information are just an example. This part explains how to add the reference data into document in LibreOffice. This consists of two parts, inserting citation and creating bibliography. Make sure Zotero and LibreOffice are running. In the LibreOffice, click on Insert Citation button. At the first usage, Zotero dialog will ask you about the bibliography standard you would use. We choose APA style here. Zotero Quick Format Citation dialog will appear. Type anything about the reference you would enter. 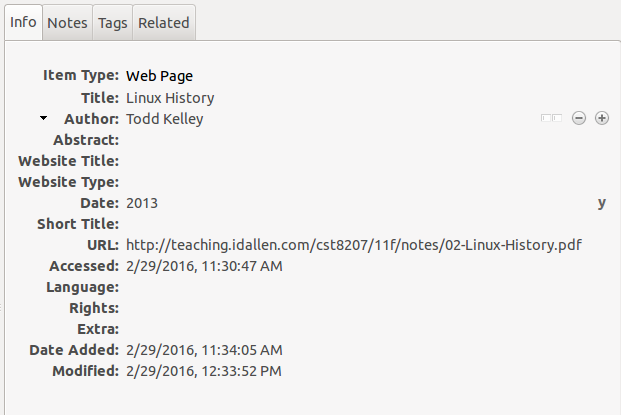 For example, we type "linux" and select "(Todd Kelley, 2013)" and Zotero add it as a citation. This will add the corresponding PDF reference from the Zotero library. We have explained more about this citing method in How To Create Basic Citation & Bibliography. Make sure you have at least one citation in a document. Place your cursor in empty space. You can refer to How To Create Basic Citation & Bibliography for more explanation.